The name common gull (Larus canus) is rather misleading, as this gull is not all that common. It is generally similar in appearance to the herring gull (Larus argentatus) but is smaller, and has a smaller, thinner bill, a more rounded head and more active flight. The upper wings are pale grey in colour and have black tips featuring white spots known as ‘mirrors’. The white head develops grey streaks in winter and the legs and bill are greenish-yellow. Juveniles are greyish brown with brown upperparts. It has a wingspan of 99-108cm, is between 40-46 cm in length and can weigh between 300-480 g.
In summer the common gull breeds on moorland on islands and cliffs close to lochs, lakes, bogs and marshes. During winter it can be seen on farmland, reservoirs, coasts, lakes and playing fields. The nest is built on the ground, on boulders, in low trees or on buildings, typically near water. 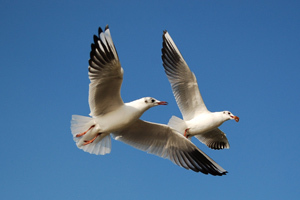 Occasionally common gulls nest in groups with herring gulls, but they may also nest alone. The nest is made from seaweed and other plant material and both birds build the nest. Pairs produce between two and five eggs, which are incubated for up to 28 days. The greenish eggs have brown blotches on them and are smooth and non-glossy. They are about 58 mm by 41 mm in size. Both birds share the duty of incubating the eggs and feeding the precocial nestlings. The chicks are fully fledged after a further 35 days. These gulls are relatively long-lived, with the maximum recorded life-span being 24 years. Common gulls eat worms, insects, fish, carrion and rubbish. This gull does not usually feed on young birds or small mammals instead it confines itself to the smaller creatures, like worms, insects and other invertebrates. In the winter, they can often be found scavenging at landfill sites with other species of gulls. Seagulls are protected under the Wildlife & Countryside Act (WCA) 1981. This makes it illegal to intentionally injure or kill any seagull, or to take, damage, or to destroy an active nest or its contents. However lesser black-backed gulls and herring gulls can be controlled under the general license issued by Scottish Natural Heritage. A general license allows authourised persons to carry out activities that would normally be illegal.